Welcome to Negombo, Sri Lanka. There are are no activities planned today so you’re free to arrive at any time. 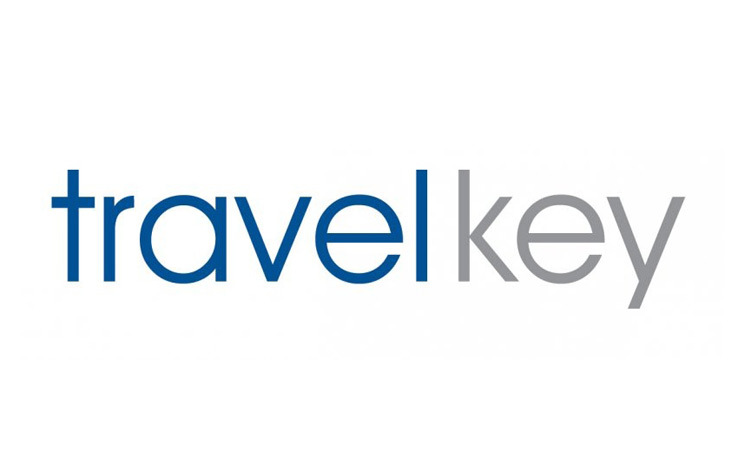 A welcome meeting with your trip leader will take place at around 6pm, so check with reception or the lobby noticeboard for details. We’ll be collecting insurance details and next of kin information at this meeting, so please ensure you have these with you. Although Colombo is the commercial capital, and by far the largest city in Sri Lanka, it’s still relatively small. You won’t be staying in the capital itself but in a place by the beach. There are plenty of beach bars, pubs and restaurants available close by. 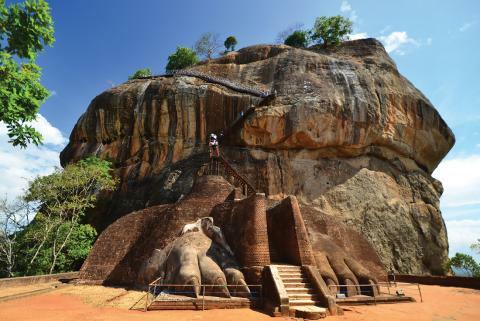 Early this morning, before the heat is too intense, head to Sigiriya (approximately 30 minutes). 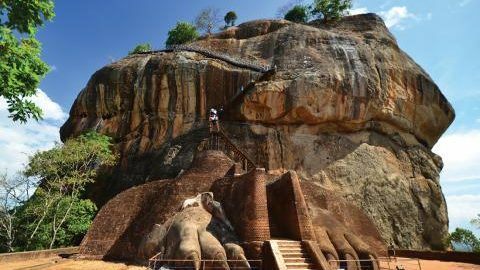 This ruined fortress is one of Sri Lanka’s premier sights. Those who make it to the top are rewarded with astounding views. Make sure you are wearing sturdy footwear, as this is a very steep climb with some uneven slopes. Those unable to climb to the top can explore the gardens at the base of the rock and still get some fantastic shots of the fortress from below. Return to the hotel for breakfast before heading to Kandy (approximately 3 hours). On the way, there’s the option of stopping at one of the region’s wonderful spice gardens for lunch. In beautifully located Kandy, visit the Dalada Maligawa (aka Temple of the Tooth), Sri Lanka’s most important Buddhist site, and mingle with the white-clad pilgrims who come here to worship. This evening, don’t miss out on the option of an early-evening performance of the famed Kandyan dancers, drummers and and fire-walkers. Today is a free day to explore the royal city of Kandy, a pleasant city surrounded by lush green hilly countryside. It’s home to a picturesque lake, old shops, a bustling market and some great restaurants. It was once the capital of the last Sri Lankan king, and the area managed to resist European control for hundreds of years, long after the coastal areas surrendered. Perhaps walk through the town to take in the sights of Kandy – explore the bazaar area or the citadel, or take a nature walk at Udawattakele Sanctuary, close to Kandy, which offers the chance to see flowers, birds and monkeys amid 160 acres of tropical rainforest. Kandy is perfect for those who enjoy walking – the town has many hidden corners to explore and views from walks around the lake are spectacular. There’s also the chance to take a day trip to Nuwara Eliya along windy roads lined by green slopes of tea leaves. This old British hill station is the heart of the tea growing industry and full of colonial charm. Built entirely during the 19th century, its quirky architecture reflects what you’d normally expect to find in an English country village, which will make you feel like you’ve stepped back in time. Journey south in a private vehicle to Unawatuna (approximately 6 hours). This fantastic stretch of beach has plenty of local restaurants and bars to relax in. There are no included activities today, so you’ll have free time to explore Unawatuna and its surrounds. Perhaps take a walk through the monkey-filled mangrove forest off Galle–Matara road or unwind with an indulgent massage. Leave Unawatuna behind and make the short journey to Galle, where you’ll jump on a train to Colombo (approximately four hours). On arrival in Sri Lanka’s capital, there’s an option to join your leader on an city walk. If you’d rather pick up some last minute shopping, then pay a visit to the massive range of shops available. Tonight is free but why not celebrate the end of this Sri Lankan adventure with a final group dinner.